…the day has finally come! 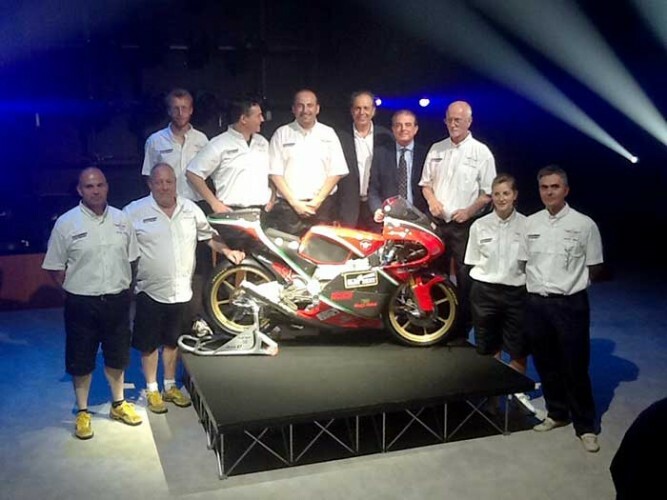 Thursday July 4, at the Clay Paky head office in Seriate, the Moto3 250cc four stroke engine was unveiled after one year of toil by Rumi-Sport Engineering. As the two-stroke engine is finally abandoned, as declared by the federation in 2012, all motorcycle firms have been left to redesign the engine, and Rumi, which has always been highly innovative, has worked hard on this new challenge, thanks to its partners such as Clay Paky, which has backed its production. At the official presentation more than 90 people participated, mostly coming from the world of motorsport: technicians, engineers, journalists in the sector, as well as two special guests: the multi-world champion Carlo Ubbiali and volleyball champion Marco Meoni. Some guests were also from the main local media - the Eco di Bergamo, Bergamo TV, VideoBergamo, Mediaset Italia2 - SportMediaset. - who carried out reports which were to be published or aired the next day on the local news stations. Finally even Clay Paky’s main media partners made an appearance to show their affinity to company's initiatives, driven as well by a personal passion for motorcycles: Sound & Lite, New Techniques, Ziogiorgio. Stefano Rumi, coordinator of the project, started by presenting the Racing Team Department, which was followed by a video that retraced the stages of the history of Rumi and then by a light show specially made by Clay Paky’s lighting designer Marco Zucchinali, culminating in the unveiling of the motorcycle in front of a jubilant audience. There was finally an in-depth- technical study, in which Rumi explained the characteristics of this new engine. "When the curtain fell and the people applauded enthusiastically, we were instantly rewarded for all our efforts," – says a touched Stefano Rumi. "Presenting such an important project in front of an audience of professionals was thrilling for the whole team. We have to thank Clay Paky for organizing this wonderful event, as well as for supporting us as a sponsor in the creation of the new engine." Pio Nahum, CCO and marketing director of Clay Paky states that "Clay Paky has a strong link with the world of sport: the main ceremonies relating to sporting events of recent years have been illuminated by our lights, such as the Olympics in London, the Football World Cup in South Africa, the South American Copa America, the Pan-American Games, the Asian Games, Commonwealth Games, Youth Games, the World Skiing Championships 2013, the Bremen Six Days cycling competition, the America's Cup in Naples, the boxing world cup between Klitschko and Shannon Briggs, to name but a few. This partnership with Rumi is above all a desire to support the project of an historic firm in our territory, but it is also a way to express our gratitude to the sporting world, which is giving us a lot of exposure. " At the event on the July 4, fans were able to delight in some of the "historic" Rumi motorcycles, exhibited in the Clay Paky showroom. Here, we are talking about the hunchback (first and second series) and Regolarità, motorcycle of the 50's, very much cutting-edge at the time, and which a lucky collector jealously safeguards as the jewel of his collection. Following the presentation, Clay Paky offered refreshments to the audience, and many gadgets were handed out, specially made for the occasion, thanks to the collaboration with Clay Paky’s marketing department. The Moto3 events are now in September, when Stefano Rumi will put his new four-cylinder on the track in the European league of its category. We will keep you up to date! In picture: Clay Paky's Pasquale Quadri and Pio Nahum with the Rumi team.